It has been nine months since I set my 11 for 11 goals. I thought this would be a good time to check on my progress and see what I need to kick into high gear if I hope to finish in the next three months. Scan pictures! This is an ongoing process. I have scanned hundreds of pictures. So I feel confident saying this is done! Work on my brickwall, Daniel Fenn. I have worked on him, but this is a poorly written goal. Is it complete, I guess? Make a concentrated effort to source every fact as I add it to my software program. This is the goal I am most proud of. I went through and sourced all direct ancestors. I don't add a fact to my program without a source. Proudly completed! Visit Miami County, Indiana to research Casper and Mary Graf further. Have not done this and I don't have a good excuse for it. If I hope to complete this I better hope for a nice fall day to visit. Attend a genealogical conference. I am still excited about the completion of this goal. I attended FGS 2011 in Springfield, Illinois three weeks ago. Start researching my son-in-law's ancestry. Completed. I have five generations on his father's side completed; I am still working on his mother's side. Talk to my mother and find out about family heirlooms in her possession. Completed. Carve out a regular research time. This was a dream goal, I think. I go in spurts with my research. I didn't accomplish a whole lot this summer, but I am working on a better system for research, so kind of completed. Make contact with newly discovered cousins and share information. This is why I love blogging. I have been in contact with new cousins through my blog. I have contacted others through email. Research myself! Add my personal facts to my genealogical software. Completed. Roots Magic made this easier. 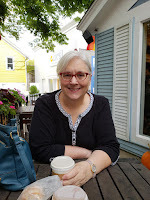 Plus, I have used the 52 Weeks of Personal Genealogy and History prompts and wrote about myself on my blog. I have completed 9 out of 11 to my satisfaction. 82%, B-! I have three more months to bring my grade up! Wish me luck! This marriage record is for my great-great grandfather, Daniel C. Fenn and his first wife, Jane E. Poor. 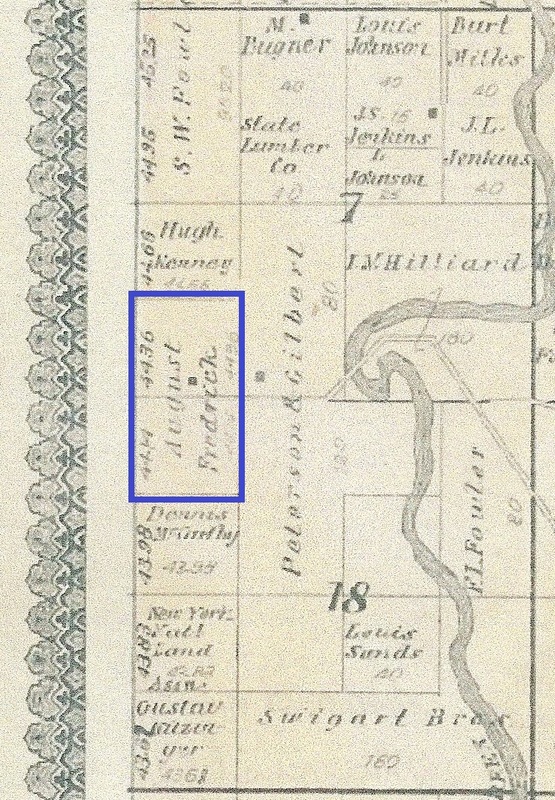 Daniel C. Fenn and Jane E. Poor were married on 4 March 1846. Jane died 12 April 1848, at the young age of 18. Daniel then married Jane's older sister, Elizabeth Ann Poor. I find it interesting that I have found the marriage record for his first marriage in 1846, but I am unable to find his second marriage record. I have estimated his marriage to Elizabeth Poor as between 12 April 1848 (Jane's death date) and 19 Nov 1850 (when first son, Zalton, is born). I guess their marriage record is just waiting to be found. What does this tell me? Samuel was of medium height and healthy weight, a little on the slender side. I imagine him being about my husband's size. I can imagine his blue eyes, light complexion and light hair. His hair turned to gray as he aged. He lost weight with age. He weighed 157 pounds in September of 1873, by 1903 he weighed 137 pounds. Samuel died in 1904. His pension file provides information about how his gunshot wound caused him to limp and eventually one leg was shorter than the other due to deterioration. Although I don't have a picture of my great great grandfather, I can create an image using the information provided in his civil war pension file. I have enjoyed getting to know Samuel through his pension file. It has helped me to reconstruct parts of his life. What source do you have that helps you flesh out your ancestor? Week 39. Least Favorite Food. What was your least favorite food from your childhood? Did your parents make you eat it anyway? Do you still dislike the same food today? How have your tastes changed since your youth? Liver always has been and still is my least favorite food. My mother loves liver and so we would have it occasionally when I was growing up. I don't remember being forced to eat it, but we were encouraged to. I remember slathering it with ketchup to try to get a few pieces down. I think it was a texture thing for me. Yuck! My husband loves liver, also. He likes it with grilled onions on it. Not me! When we were first married, I thought I would be a good wife and fix one of his favorite dishes. I think it was mustard that I slathered on it that time. I still had trouble eating it. So, I don't fix it anymore. I fix his other favorite meal, Chop Suey, instead. Thankfully, I like that. I think my tastes have grown over the years. I grew up on pretty standard Midwestern fare: meat, potatoes (or some other starch), veggies, and sometimes, dessert for dinner. I have said before what a great cook my mother is, so most of what she cooked I liked. These days I am trying to add more fish into our diet. I like to have a meatless meal once a week too. I love to try new recipes, so I rarely fix the same thing twice in a month. But, one thing that isn't on the menu is liver, Yuck! Print Source: Geo. A. Ogle and Co., Standard Atlas of County, Michigan: including a plat book of the villages, cities and townships of the county...patrons directory, reference business directory... (Chicago, Illinois: Geo A. Ogle and Co., 1903). p 27. This is a cropped image of the same map above. The boxed area is the farm of August Fredrick. It shows who owned the land surrounding him. None of the names are relatives as far as I know. 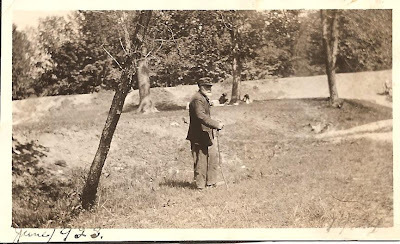 August Fredrick on his farm in June 1923, six months before his death. My great grandparents farmed this land until they sold it to their son. It was sold to August's son, Otto August Fredrick, who sold it to his son, Otto Robert Fredrick, who sold it to his niece and her husband. It has been in the family for 110 years. This past year it was given Michigan Centennial Farm distinction, meaning it has been owned by the same family for at least 100 years. Found in Glover, Hattie L. "Fenn". In The Holy Bible: with Revised New Testament. Chicago: GW Borland & Co., 1882. Original owned in September 2011 by Brenda Leyndyke, [address for private use], Battle Creek, Michigan. Clipping from The Benzie County Record Patriot, Frankfort, Benzie, Michigan 23 February 1956. 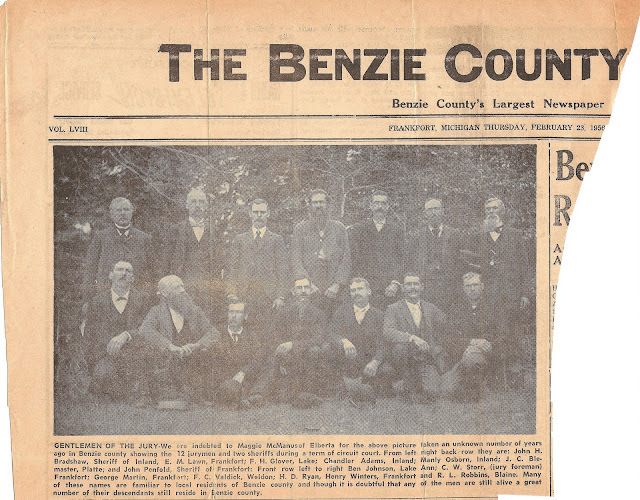 Caption: GENTLEMEN OF THE JURY-We are indebted to Maggie McManus of Elberta for the above picture taken an unknown number of years ago in Benzie county showing the 12 jurymen and two sheriffs during a term of circuit court. From left right back row they are: John H. Bradshaw, Sheriff of Inland; E. M. Lawn, Frankfort; F.H. Glover, Lake; Chandler Adams, Inland; Manly Osborn, Inland; J.C. Blemaster, Platte; and John Penfold, Sheriff of Frankfort. Front row left to right Ben Johnson, Lake Ann; C.W. Storr, (jury foreman) Frankfort; George Martin, Frankfort; F.C. Valdick, Weldom; H.D. Ryan, Henry Winters, Frankfort and R. L. Robbins, Blaine. 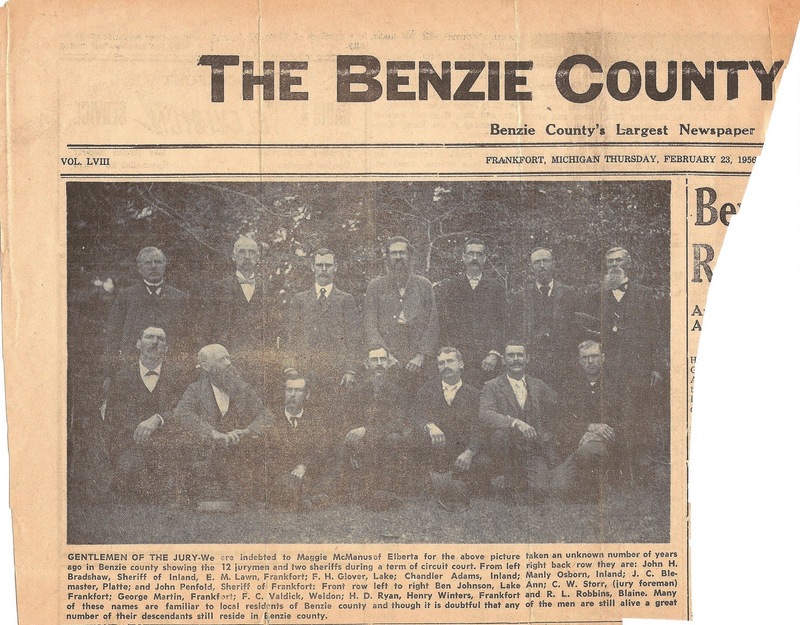 Many of these names are familiar to local residents of Benzie county and though it is doubtful that any of the men are still alive a great number of their descendants still reside in Benzie county. This newspaper clipping was literaly "ripped from the headlines" from the looks of it. I found this in my great grandmother's, Hattie Fenn Glover, bible. Hattie's husband, and my great-grandfather is the F. H. Glover, who is third from the left in the back row. I have a couple of other pictures of Frank H. Glover: one is when he was a young boy and the other is on his wedding day in 1882. I enjoyed seeing what he looked like at this point in his life. This picture must have been taken before 1910. Frank and Hattie Glover can be found in the 1900 U.S. Census for Benzie County, Michigan. They have moved to Marquette, Michigan in time for the 1910 U.S. Census. I don't know any of the particulars concerning the case the jury served on. I will have to add it to my 'to-do' list. Do you know anyone in the photo? Please leave a comment if you can provide more information. Doesn't it feel great when you are contacted by someone who has read your blog and can add information to what you have written? I know I enjoy that aspect of blogging the most. Recently, I was contacted by Patricia, the great, great granddaughter of Catherine Wheeler. I have written about Catherine Wheeler twice. Once was to share the information I had found in my great grandmother Hattie's Bible. The next time was to provide information that Apple from Apple's Tree had found for me about the Wheeler family. Catherine Wheeler was listed as a mother-in-law in the 1900 and 1910 United States Census, living in the household of Frank H. and Hattie Glover. Further research proved that she wasn't related. Hattie Fenn Glover's Bible had newspaper clippings about Catherine Wheeler and the use of the name "Grandma Wheeler" was written on the clippings. To learn more about these two events, click on the links above. Patricia shared the following information that her dad, Edward John Blake, had given her concerning the Wheeler family. Catherine Wheeler was Edward's great grandmother. I am sharing it on my blog as a means to understanding the connection Catherine Wheeler had to the Frank H. and Hattie (Fenn) Glover family. There is no blood relation that I have found, but she was important to the Glover family. If you are related to the Wheeler family, please contact me or leave a comment on my blog. I would love to figure out the relationship of Catherine Wheeler and the Glovers. 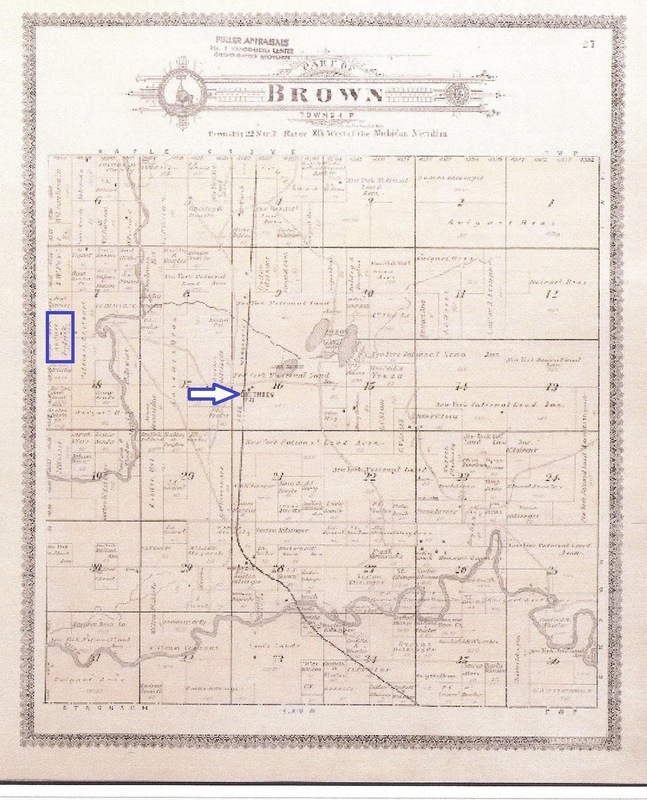 John Branchflower, Edward's great grandfather, was born in England in May of 1818; died at Rockport, Ohio 22 February 1847. Lucy Ann Barber, Edward's great grandmother, was born in New York on 28 September 1827; died in Litchville, Ohio on 23 May 1856. Dr. Josiah Tyler, Edward's great grandfather was born 5 December. Catherine Louisa Tyler Wheeler, Edward's great grandmother, was born 18 February 1828; died 10 June 1918 in Jackson, Michigan; burial Woodland Cemetery, Jackson, Michigan. John Richard Branchflower, Edward's grandfather, was born 28 February 1844 in Cleveland, Ohio; died 4 December 1918 in Jackson, Michigan. John Richard Branchflower and Emma Amelia Tyler were married 19 August 1875 in Jackson, Michigan. Emma Grace Branchflower, Edward's mother, born 7 July 1878 in Jackson, Michigan; died 7 July 1943; burial in Woodland Cemetery, Jackson, Michigan. Emma Grace Branchflower and Claud Goodall married 16 March 1897; divorced 23 May 1913. Emma Grace Branchflower Goodall and Edward Thomas Blake, Edward's father, married 10 October 1915. Edward Thomas Blake, Edward's father, died 15 February 1959. Edward John Blake born 20 August 1918 in Jackson, Michigan; died 3 November 1993. Patricia shared her dad's description of his early years at Clark Lake in Michigan. 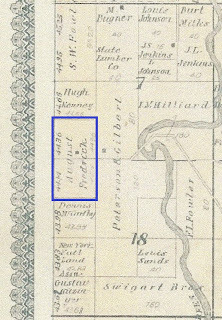 Edward's parents bought three parcels of land. One parcel on the lake had a home. Another parcel had a grocery store, which his dad ran. There was a two room schoolhouse on the lake. His dad was active in scouting and was a drummer in the American Legion band. In 1933, the family sold the grocery store, due to the depression, and moved to Ypsilanti. Edward became the produce man for the first A and P store in the country. The store was in a streetcar barn. He was sent to other towns to train produce men in other new stores. Week 38. Hobbies. Did you have any hobbies as a child? Which ones? Don't you just love it when you discover that your mother saved something that you made as a child? The pot holder pictured above was one that I made as a child. 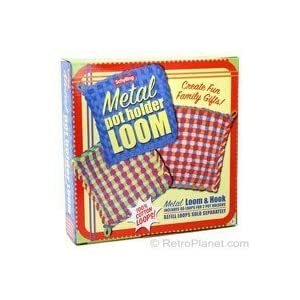 I remember receiving a kit with a metal loom, hook tool, and cotton loops. You stretched the loops over the metal frame and then using the hook tool you weave the loops going the opposite direction. When I first started making pot holders, the loops were cotton, as the one above is. Later, the loops were a synthetic fabric, maybe nylon or polyester. I remember going through a few bags of loops. I liked to color coordinate the pot holders as opposed to making them multi-colored. I have always been drawn to any type of crafting. In addition to making pot holders, I remember having a pom pom kit (see picture above). 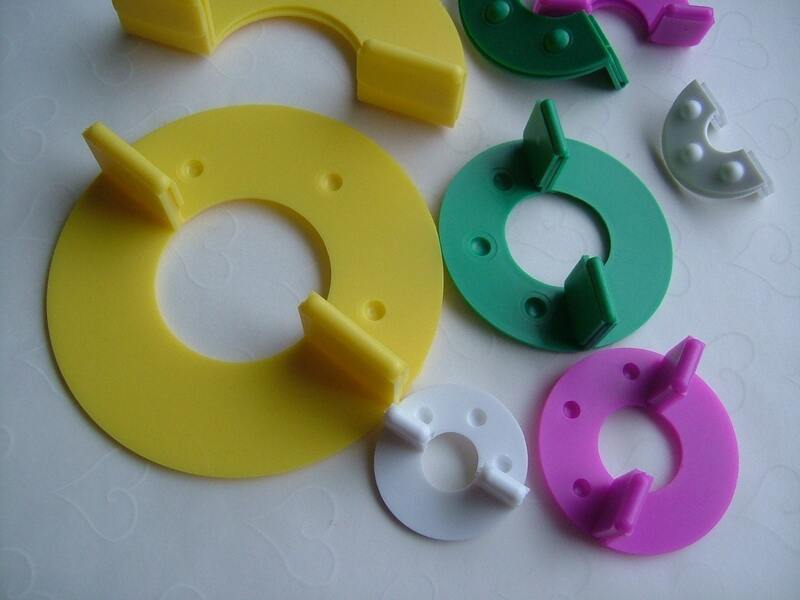 You wound yarn around plastic molds, tied the center, cut the yarn. There were different sizes of pom poms you could make. I must have had pom poms on every thing I owned. I dabbled in hook rug making too. As I matured (no comments here, please) I graduated to macrame, making Christmas candy cane and wreath ornaments. I still hang those on my tree now. Christmas crafts were always a favorite of mine. I taught myself how to crochet in college. I am left handed and could never find anyone to teach me how to crochet left handed, so I did it myself. The first thing I made was a brown and tan afghan. I never could figure out how to knit though. Another favorite craft of mine was cross-stitching. I loved to cross stitch. I use the past tense because I have arthritis in my right thumb and cross-stitching now is not an easy thing to do. I have made baby gifts, Christmas gifts, bridal shower gifts and many projects which I kept for myself. I have cross stitched pictures, Christmas ornaments, and pillows. I haven't given up on cross stitching completely. I started a lovely Christmas manger scene on linen and I plan to keep working on it. It is the most difficult project I have attempted. Ibuprofen is my new friend when I cross-stitch. When I was deciding on a college major, I thought about what I enjoyed doing. I came up with cooking, sewing, working with children and crafts! Voila! A home economics teacher I became. Blending my hobbies with my career was great. Even though I am no longer teaching I still enjoy crafting-when my thumb cooperates! What crafts do you enjoy? Week 37. Earliest Memory. What is your earliest memory? My childhood memories are closely tied to what house we were living in at the time. I can't pinpoint what would be my earliest memory, but I do have memories of the first house I ever lived in. My childhood memories really begin around the time I went to Kindergarten. It was September of 1962, I was 4 years old. I remember my mom helping me cross the street and then I walked the 4 blocks to school. Other early childhood memories include playing with neighborhood friends; putting a play on in our garage and inviting neighbors to come see it; playing in the back room of our house (it's where we use to hide our vitamins!) and my mom baking goodies in the kitchen. I guess you could say I had a very traditional midwestern upbringing. One I am thankful for. Here are a few pictures from Springfield, Illinois. Enjoy! Are You Ready for Some Genealogy? After the Keynote Speaker, heading to the Convention Center. Entering the Prairie Capitol Convention Center on Thursday. Lincoln Library, on left, and First Presbyterian Church with Lincoln Pew, on right. Mennonite Research: The Forgotten Swiss Germans by Michael D. Lacapo. Anyone who overlooked Dr. Lacapo because of the DVM behind his name instead of the other genealogy related initials made a mistake. Dr. Lacapo presented helpful tips and resources to use with your Mennonite ancestry. This hour flew by, not an easy thing to do at 8:00 a.m. Developing Effective Research Strategies by Linda Turner. Ms. Turner presented an eight step research strategy that is sure to enhance my research. Using a case study to apply these steps brought together the whole process in an easy to understand way. The session ended with research tips. Michigan Roots: Genealogy Research in the Wolverine State by Kris Rzepczynski. You may wonder why someone who has researched eight great grandparents in Michigan and lives in Michigan would attend this session. The main reason was Kris. (He is a Bronco, afterall!) I have heard him speak previously and wanted to attend another of his sessions. I wasn't disappointed. Plus, I have a great list of further reading to look for. COOKBOOKS!!! But guess what? I controlled myself and didn't buy even one. I did text this picture to my hubby and said, "guess what I found" His reply, "oh, no!" Exhibit Hall and Lunch-I decided to take one last look at the exhibit hall during lunch. I think the exhibitors should be happy as I noticed lots of selling going on. A couple of the books I was thinking of getting were sold out. I took this opportunity to talk and learn more about new products and services. A concession stand lunch of turkey wrap completed the time. Online, On Microfilm and In Print: Finding Ancestors in Newspapers by James L. Hansen. The takeaway from this session was an understanding of why there aren't very many free sites for newspaper access. It is expensive to digitize newsapers due to their size. A nice list of sources for newspapers was given in the syllabus. The Genealogical Proof Standard: What It is and What It is Not by Thomas W. Jones. Dr. Jones answered all my questions I had concerning what GPS is. I knew a little about it, but wanted to develop a better understanding of it. This session provided that for me. I was happy to hear that overkill is not needed when researching, you just need to prove the fact. Scotland's Old Parish Registers: How to Access, Use and Interpret by Paul Milner. What a delightful way to end the conference. Mr. Milner is an entertaining and very well-informed Scottish speaker. I learned so much from this session. Historical background, church records and resources was presented. Using Scotland's People was covered as well. First, I need to say a great big thank you to those responsible for presenting a great conference. To the co-chairs, D. Joshua Taylor and Paula Stuart-Warren, thanks for your leadership. From the speakers, the Illinois Genealogical Society, Ancestry.com, FamilySearch, exhibitors, volunteers, conference committee, and all the sponsors this was a well organized, educationally sound conference. Thank you. To the attendees who were warm and welcoming, thank you. It was nice to sit next to fellow genealogists and learn from you too. To geneabloggers, thank you for welcoming me into your community. To the Springfield Hilton, thank you. My room was a great place to go to after a very busy day. To the downtown Springfield businesses, thanks. I loved the welcoming signs and friendly staff. I have lots of new ideas for blog posts and how FGS 2011 help me with my research, so check back for that. 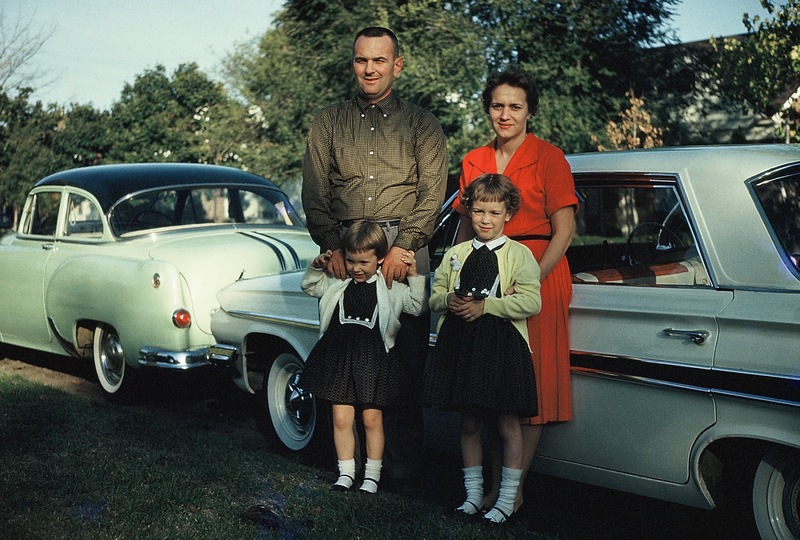 Records and Repositories at the Crossroad of America-Indiana Research-Curt Witcher. Curt Witcher was a wonderful way to start at 8:00 a.m. His enthusiasm for genealogy spills over to the audience. He talked about the history of Indiana, vital records availability, and organizations and repositories. Demystifying Eastern European Research-Lisa Alzo. Lisa, a fellow geneablogger, talked about keys to success, complications, myths, and sources to help with your eastern european research. The importance of networking through social media, genealogical queries in publications and online was discussed. Effective Search Techniques and Sound Research Practices on Family Search by David Ouimette. Even though I have used family search many times, this was a helpful class. He talked about the tools Family Search has developed to help us in our research. Additionally, he discussed browsing digital images, using sound research principles and practices and exploring the Family Search research wiki's. German Research by Tamra L. Stansfield. I was so glad I signed up and paid for this four hour workshop. Ms. Stansfield presented a wealth of information that I am hoping will further my German research. She divided the class into four sessions, with breaks in between. First, she talked about resources, language, and handwriting, giving helpful tips for each. Next, she discussed finding place of origin, stressing to scout ALL U. S. sources before looking for German ones. A great lesson on understanding Meyers Gazetteers was welcomed. Third, an understanding of the historical events that impacted our ancestors was given. Lastly, Ms. Stansfield presented resources for German research. Unfortunately, the workbook that Ms. Stansfield created and sent to Springfield never arrived. Luckily, Family Search has agreed to mail them to us once they are located. FGS 35th Anniversary Gala-This was the only extra event I attended and it was a good one to attend. An entertaining skit on the history of FGS started the evening. 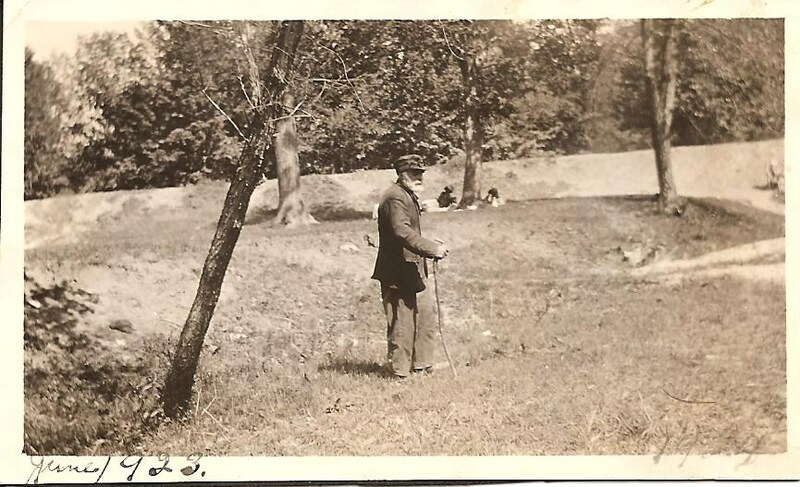 Harold Holzer presented "The Lincoln Family Album" which showed many family photo's and a few surprises. Who would have thought that John Wilkes Booth's picture would be included? Tomorrow, Day 4, is the end of the conference and will be the day I take the most sessions, six! Check back for those updates. Yesterday, was day two of my four day conference at Federation of Genealogical Societies (FGS) 'Pathway to the Heartland" conference in Springfield, Illinois. I continue to be amazed at how smoothly this conference is run. Again, I cannot say thank you enough to all the wonderful people at FGS and the Illinois State Genealogical Society, the local host for the conference. The opening of the conference with a posting of the colors, complete with drum and trumpets. Learning that 2000 attendees are here. Wow! Taking to heart the Mayor of Springfield's welcome and invitation to "spend lots of money!" Listening to the keynote speaker, David S. Ferriero, the archivist of the United States. Attending four sessions that furthered my genealogical education. Visiting the exhibit hall, three times. I controlled my purchases to a flip pal scanner cover, a map of 1820 Prussia, and a Diet soda. I could spend a small fortune on books, but I am trying to control myself. Getting my beads on! I received beads identifying me as a geneablogger from the geneablogger guru, Thomas MacEntee. I feel so loved! Meeting lots of fellow geneabloggers at a meet up at Bennigans. It was so nice to put faces to the bloggers I have read and been inspired by. Overlooked War of 1812 Records in the National Archives by Marie Varrelman Melchiori. I left this session realizing I need to spend more time learning about the national archives. Thankfully, Ms. Melchiori gave us a wonderful bibliography and tips on how to get more information. The Illinois State Archives by Gregg Cox. Mr. Cox is the archivist of the archives and provided lots of information on what is available there in an entertaining way. Illinois residents receive help and searches for free. (I may have to enlist my favorite Chicago resident, my daughter, for help.) Out of state residents pay a nominal fee. Discovering Old World Origins with U. S. Records by David Ouimette. This session provided lots of places to look in the United States for the country of origin of your ancestor. Mr. Ouimette stressed the importance of looking in the United States before you make the jump to another country. I can't wait to get home and use his ideas and tips for immigrant research. Going Beyond the Bare Bones: Reconstructing Your Ancestor's Lives by Thomas W. Jones. In this sold out session, Mr. Jones used four case studies to demonstrate how to take information gleaned from records to create biographical type narratives. He included genealogical sources which are helpful in creating these biographies. All in all, I am thankful for the opportunity to grow and learn as a genealogist. My goal for today is to take some pictures! Check back tomorrow for a Day 3 update, including my four hour German workshop. I just may get enough information to break through my German brick wall! (Fingers crossed). I'm here and connected!. Here, is the Federation of Genealogical Societies 2011 Conference "Pathways to the Heartland", in Springfield, Illinois. First, I would like to thank all the volunteers who worked so hard to make this available to the many genealogists who are attending. The organization is superb. From the moment I stepped in the door of the Prairie Capital Convention Center, I have felt welcomed. Effective Editing and Writing by Pamela Boyer Sayre. Practice, Practice, Practice was the take home lesson I got from this session. I was pleasantly surprised that I had a couple of the resources she mentioned on my shelf at home: Chicago Manual of Style and Evidence Explained. Finding and Keeping Volunteers by Amy Johnson Crow. Amy says "we get so wrapped up in the genealogy we forget the society". She also provided lots of information on fitting the volunteer to the position and finding the right people for the job. Building a Society Education Program for Genealogists and Family Historians by J. H. Fronkert. This session went through all the things one should think of when putting on a society program. Identifying the purpose, audience subject matter, etc. was presented. A few minutes at the end was given for audience suggestions, lots of good ideas were shared. Today starts with the keynote speaker, David S. Ferriero, Archivist of the United States. After that the exhibit hall opens and more sessions are held. I plan to attend four sessions today. The Society Showcase is tonight as well as the much anticipated Geneabloggers meetup. It will be a full day, one that I am looking forward to. After all, I'm Connected! My mother's sister (and my godmother) is celebrating her 93rd birthday today. Kathryn Louise Fredrick was born 6 September 1918, in Manistee County, Michigan, to Otto August Fredrick and Daisy Ellen Graf. She was the oldest of eleven children born to them. 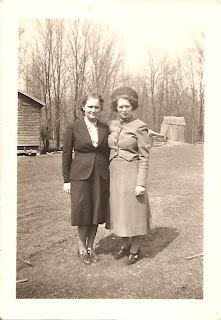 L-R: Sisters, Marie Fredrick and Kathryn Fredrick, picture taken on the family farm, date unknown. Aunt Kate has always been very special to me. I have wonderful memories of visiting her in Brethren, Michigan. I have visited many times throughout my life, as a baby, child, teenager, college student, and even after I was married and had children. My most recent visit to Aunt Kate was in a nursing home. She was diagnosed with Alzheimer's about ten years ago. She didn't recognize me or my mother, who I took to see Aunt Kate. Alzheimer's is such a terrible disease. My thought and prayers are with Aunt Kate and her family as they live with a life changing diagnosis. I hope in some small way that Aunt Kate knows it is her birthday and is celebrating in a way she deserves. Happy Birthday, Aunt Kate. Harbor Beach High School, Harbor Beach, Michigan around 1974. The United States is celebrating Labor Day today. Labor Day is a day to recognize the contributions that workers have made. I have chosen to celebrate teachers. Teachers have been under fire in our state of Michigan, lately. I won't get into the specifics, but needless to say I am on the side of teachers. Teachers make a difference every day of their lives. They work tirelessly for the benefit of their students. They spend their summers improving themselves and preparing for the next year. I have been blessed with very good teachers in my life. From my favorite first grade teacher, Mrs. Merriman, to a favorite sixth grade teacher, Mrs. Davidson, I have fond memories of caring, dedicated teachers. Junior High was no different, a math teacher, Mrs. Weikert, took the time to help me learn to relax during tests. Mr. Bishop, a science teacher, inspired me to go to college. He brought an enthusiasm to his teaching I would have loved to replicate. High school teachers that I found especially helpful include Mr. Clark, Biology; Mr. Tippett, Government; Miss Witkovski, English; Mr. Miljour, Biology and Mrs. Brobst, Home Economics. Again, teachers make a difference! There are a few teachers in my family. My dad, taught for 41 years before retiring. After retirement, he decided to be a golf coach and did that for another 5 years or so. 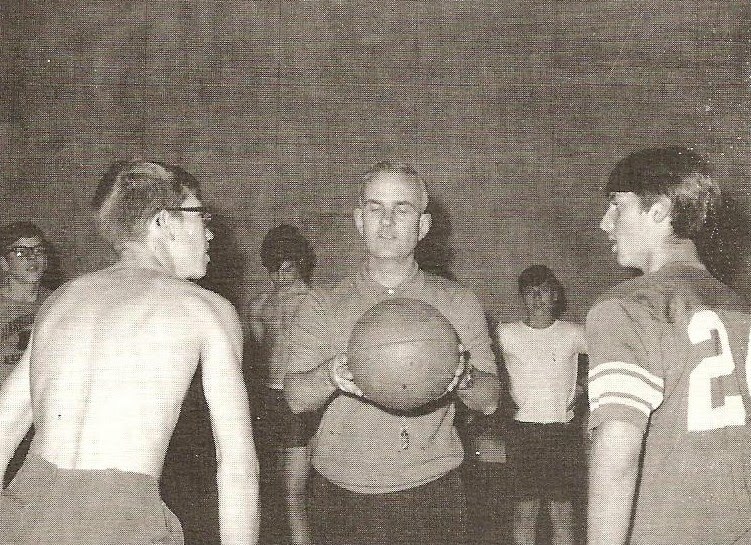 I never had my dad as a teacher as he taught physical education and it wasn't co-ed in those days. 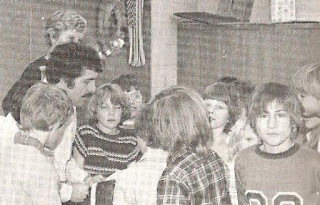 Deckerville Elementary School, Deckerville, Michigan in 1981. I married a teacher. My husband, Kirk, has been in education for 36 years. He was an elementary teacher for many years. Currently, he is a middle school counselor. He loves his job. It is getting to the time where he should be thinking about retirement, but he loves working with the students. After an unusually challenging child abuse case I asked him how he does it. His reply was he wants to be the one to make a difference in a child's life. He wants to be there for them. An attitude I have heard time and again from many, many teachers. How are you feeling today? My husband has this poster in his school counseling office and I think I am running the gamut of feelings today: nervous, happy, overwhelmed, hopeful, but most of all ecstatic! Nervous that I won't be ready in time, which leads to feelings of being overwhelmed. Happy that I am going! Hopeful that I will learn a ton, meet lots of great people and have a great time. And of course, ecstatic that I will be in Springfield in 3 days! YE HA! One of the ways I cope with the negative feelings is to get myself organized. The more organized I am the better I will feel. How organized am I? Pretty organized, I think. I have a file folder for each day, Wednesday through Saturday. In each folder is the days schedule and syllabi for classes I plan on taking. Another folder is full of syllabi of classes that interest me (second choices) in case I need a back up plan. One folder has my master schedule for the week in it. Plus, a copy of all sessions, hotel info, a downtown Springfield map, and address labels. This is my low tech prep! I do have my calendar, notes, maps, syllabi and other information accessible on my lap top and/or smart phone. I have charged the various electronics that I think I will need: phone, camera, computer and ishuffle. The chargers are all in one place. I have my ishuffle loaded and ready to go. My play list has everything from genealogy related podcasts to Coldplay to Bruno Mars to Broadway tunes. I figure this will be a good way to unwind after a long day of what I am imagining is going to be information overload. One thing I am not concerned about is the drive to Springfield. I have been to Springfield before and am very comfortable with the drive. If you haven't been to Springfield before, you are in for a treat. It is rich in history and culture, a great place for a genealogy conference. Oh, and I can't forget I have my i-pass ready so I can zoom through those pesky toll booths south of Chicago. I will be keeping within the speed limit, of course. I would hate to have to use my exhibit shopping money for a speeding ticket! Now, the only thing I have to do is pack. I am feeling confident about that. How are you feeling today? Dad, Mom, Brenda and Linda in Ferndale, Michigan outside of Uncle Hank's and Aunt Mabel's home. Do you remember the license plate game? My sister and I would try to find the most out-of-state license plates we could when we would go on road trips. Another road trip activity was to be the first one to spot an object, it could be on the road, on a billboard, or anywhere. For example, be the first one to spot a ball. I remember another game where we tried to find letters that spelled words. We would be looking at license plates, billboards and anything with writing on it. We didn't travel a whole lot when we were children, but I do remember going to Detroit a number of times. It seems like we would combine a school shopping trip with going to the Detroit Zoo almost every year for many years. I loved the Detroit Zoo. I liked the train ride, the large animals, eating lunch there, and the balloons. One time just as we got to the car, I lost my balloon. Needless to say, I wasn't very happy. Thankfully, my wonderful dad went back and got me another one, which I am sure made the trip home a lot quieter for my parents. Most road trips included my dad, my mom, my sister, Linda, and myself. Later, two more siblings joined us. I don't remember very many road trips when there were six of us, probably didn't have a big enough car. My dad always drove and my mom would sit in the front seat. My sister and I were in the back playing games, reading, or sleeping. 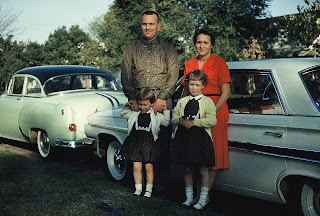 Road trips to Detroit were usually fun because we usually would stop at my Aunt Mabel's and Uncle Hank's home in Ferndale. I can't think of a better trip than the Detroit Zoo, shopping and visiting one of my favorite aunts. I am so excited and looking forward to next week. I am going to FGS's "Pathways to the Heartland" Conference in Springfield, Illinois in five days. Yikes! Only 5 days to get ready. Luckily, I am within driving distance so I don't have to worry about limiting what I take. I am comfortable about the drive as I have been to Springfield before. My daughter, Kirsten, attended college about 40 miles east of Springfield in Decatur, Illinois and I made the trip numerous times, sometimes going down and back in one day. I am glad I don't have to do that this time. I plan to arrive on Wednesday in time to attend one or two afternoon sessions. I have been pouring over the wonderful syllabus and have about 75% of my sessions selected. I thought I would be flexible, or in other words, I had trouble with a couple of time slots-too many good choices. One thing I am looking forward to is the German Workshop. Four hours of learning should get me on the right path with my mother's side of the family. Other activities I plan to take advantage of include the Geneabloggers Meet Up and FGS 35th Anniversary Celebration. I didn't think I was going to be able to get to Springfield on Wednesday so I missed out on tickets for the Prairie Social, but know there will be lots of other opportunities for fun. So, look for me at FGS 2011, I will be the one with white hair!